I had a seizure at work, and while my colleague know what to do, obviously my clients don't always know. Poor lady, I freaked her out- I just started wandering around with my camera, mumbling nonsense, and grabbing at myself. She thought I was having a stroke. Once she was told what was happening, she settled down (she works in the medical field, so she understood- she's just usually behind a desk). I was sat down, given water, a migraine pill, and we continued with her shoot. But the client asked what she should do if she should do, and how she could recognize a seizure in the future. Here's an info graphic for everyone, bc really, there's not enough info out there. If the person stops breathing, call 911. That is serious. If they are breathing, it's not really necessary. It's just a medical bill (an expensive one), we really can't afford. If you aren't sure, or the seizure lasts over 10 mins, err on the side of caution, and make that call. Other than that, this is how we live guys. Just another day for us. *note: I am not saying never call- I am just pointing out that this is how people with epilepsy live. Ask yourself if it is an emergency. If you feel it is, by all means, call. At one point I had at least a seizure a day- the fall on the ground and all of that kind. My university called 911 each time, and that came out of my pocket book. I almost had to drop out of school, bc the insurance company deemed it "not life threatening." I mean, I fought, and won, but I'm not sure everyone can do that (they can't) and really, I should've been studying. End side note. If we fall, and have a seizure on the ground, loosen tight clothing, and move things we may hit if possible. Place something soft under our heads, like a sweater. The recovery position is on the side, in the fetal position. For the love of Zeus - DO NOT PUT ANYTHING IN THE MOUTH! This can damage teeth, and obstruct the airway. Bad idea, and really bad. As Jane of the Flobberworms pointed out: don't try to catch a falling person (unless you have training to do so). You risk further injury to the person and yourself. Also, don't hold the head down. Neck injury city that is. Time the seizure if you can. This info is good to give a doctor. But write it down- the person having the seizure may not remember what you tell them just now. When the person "wakes" up or comes out of it- they may be super tired, disorientated, or not remember anything. They may have lost a few days worth of memory. I once lost a month after cycling seizures for 3 days. It happens. They may be totally fine- I went right back to work bc I had a partial complex seizure. I did have a kickin' headache though. Recovery can vary wildly. After a big one I sleep like a rock. Also, if the person needs to go home, and they are still have the legal ability to drive (laws vary state to state on that), offer a ride, as seizures can cluster, and the brain is still recovering. Not the best time to drive. Seizures are not fun, and super embarrassing guys. It's not unheard of the pee (yay me in highschool! ), or to say something you would never say, or to throw punches at an EMT and wake up in handcuffs bc they think you are on drugs- and have no clue what happened. So try to be sensitive and supportive. It's also scary to watch. As a side note: 1 in 26 people will have a seizure in their lifetime- (not necessarily from epilepsy though). So it's good info to have! Also, you can't catch it (I know you guys know that, but I still get asked that, so just throwing it in there). One last thing- epilepsy is linked to depression, for a lot of different reasons. Brain chemistry, social reasons, AED medication side effects, the stigmata or being unable to work/ getting laid off/ not driving- all kinds of stuff. So there's that. This has been a public service announcement. Feel free to ask questions, and I will do my best to answer as best I can while at work today. 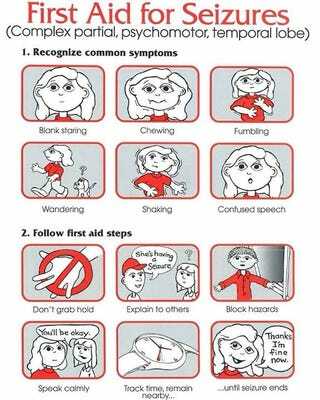 If anyone here has epilepsy/ cares for anyone with epilepsy and wants to add/ correct- that's awesome too. And finally: www.epilepsy.org for more info. They are awesome.